On Friday, the highly anticipated Furious 7 flick debuted. For months, the film has received a lot of chatter and buzz. No doubt, part of the reason for this is the fact that everybody was expecting a breathtaking movie with insane stunts and a solid story line– something they’ve delivered time and again, especially after they found their second wind and added Dwayne Johnson to the mix. 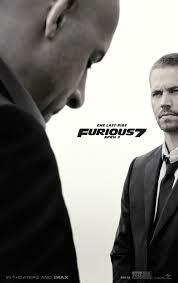 But more importantly than that, the new Furious 7 film has been receiving so much attention because it is the last film that will feature Paul Walker– who unfortunately passed away during an auto accident late last year. Well, that unbelievable mix of hype and emotion paid off big-time for the movie series over the weekend, as Furious 7 reeled in a staggering $143.6 million at the U.S. box office. Worldwide, things got even better as the movie pulled in an UNBELIEVABLE $384 million!! That load of cash helped the movie become the biggest April opening of all-time (breaking Captain America: The Winter Soldier‘s previous record of $95 million), and helped it to become the 9th biggest earner EVER. That’s right; the movie did better than any of the Twilight movies, better than Sony’s Spiderman, and a score of other all-time notorious moneymakers. Only adding to the money-making credentials is the fact that the “Fast and Furious” franchise is now Universal’s most lucrative film series ever! So, what are the plans for the future? Well, Sony has already given the green light for another flick, stating that they think this could be a James Bond-esque/Mission Impossible-like series. So, even though nothing has been confirmed or even written yet, none of us should be surprised to see more from the franchise. This entry was posted in Culture and tagged box office, dwayne johnson, Fast and Furious, Fast and the Furious, furious 7, paul walker, the rock, vin diesel. Bookmark the permalink.